Every month the Democrat Club collects money for designated local charities. In 2018 we chose two charities: Freedom’s Rest (Christian County’s only domestic abuse shelter) and St. Joseph’s Food Pantry of Billings, with the monies split 60/40 between the two, respectively. New chair of the Christian County Democratic Central Committee, Diane Stalder, lead a spirited evening of conversation and camaraderie! Friends gathered to share stories of last year’s events, both the good and the bad. Joe Pitts, former Executive Director of the James River Basin Partnership, spoke on national and local environmental issues, calling on us to act now. Bob Rubino reported on the Missouri Democratic Party meeting and election. Zoe Billedo inspired us with reflections on looming environmental challenges. And, the Cattywampus Band, always a pleasure, lifted our spirits and provided the background for conversations among fellow Southwest Missouri Democrats, giving us renewed energy for the future. 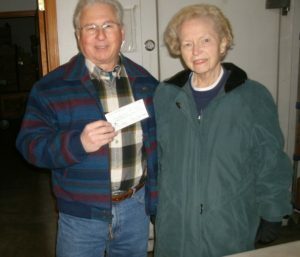 The auction (conducted by Matt Patterson) of food baskets and other special items was a great fundraiser for Christian County Democrats. Thank you all for participating and making it a successful evening! YOU will be voting for our next US Senator and our next US Representative. YOU will also be voting for our next State Senator, State Auditor and State Representative; YOU will be voting for our next County Presiding Commissioner, County Clerk, Circuit Court Clerk, Recorder of Deeds, Collector of Revenue, Prosecuting Attorney, and County Auditor. YOU will be able to choose local judges and choose which judges should be retained or not. AND yes, there’s more! YOU have 4 Missouri Constitutional Amendments to vote on, and 3 Missouri Propositions. These are all IMPORTANT positions. Please be informed! Here are some sites to visit to make a wise decision: Check the Christian County Headliner or the Springfield News-Leader, or the League of Women Voters “Voter’s Guide” (at local libraries and stores). If you can’t find a copy of the “Voter’s Guide,“ go to www.vote411.org. **We are especially proud that we have local Christian County Democratic candidates running in this election: for the 139th District, Cora Hanf; for the 140th District, Tony Smith; for the 20th Senate District, Jim Billedo; and for Presiding Commissioner, Bob Rubino. PLEASE MAKE SURE YOU VOTE FOR THESE CHRISTIAN COUNTY DEMOCRATS! If you will not be able to vote on Tuesday, November 6, make sure to get an absentee ballot. To obtain an absentee ballot, contact the Christian County Clerk’s office (417-582-4340). AND PLEASE, DON’T FORGET TO VOTE! If you have any questions or would like more information, please email Polly Dross.